Employee recognition is worth the time and the money you spend on it. You have no other tool at your disposal that so predictably makes employees feel good about your company and goals. It encourages employee engagement and employees who feel recognized and appreciated are likely to be your best employees. From recognition and thank you letters to bonuses and gifts, employee recognition is good for workplace motivation and creates positive employee morale. Your options for employee recognition are numerous and limited only by your imagination. Some companies give annual bonuses to employees who contributed during the year. Depending on your circumstances including company profitability, your line of work, the expectations in your industry, and your past practices consider giving employees a bonus. They appreciate the recognition and the employer who provides it. If you can't afford a cash bonus, buy the employees a reasonably priced gift. (Company merchandise with logos can work well as gifts.) If a gift is not on the horizon—and it may not be for public sector employees, as one example—at the very least, adopt the habit of writing letters to employees for recognition and to thank them for their contributions. Sometimes, though, a simple thank you letter, that recognizes specific employee contributions, goes a long way in helping employees feel recognized and rewarded. In fact, an employee recognition letter that accompanies a bonus check or a gift magnifies the recognition that the employee experiences. 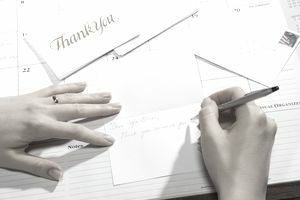 Some employees experience such gratification that they post the thank you and recognition letter in their cubicle, office, or workstation for years. An employee recognition letter does not need to be elaborate but it does need to cover specific territory to obtain the results you'd like to see from the employee recognition letter. Describes in specific detail the behavior you'd like to encourage more of in the future. Says thank you and that the employee contribution is appreciated. Is written and given close in timing to the event you are praising. Is handwritten on a note or card, or even an email if the email is customized and avoids sounding like a form letter. As a general tip, avoid the feeling of a form letter at all costs if you wish the employee to feel individually rewarded and recognized. Following are two examples of effective employee recognition letters. Download these employee recognition letter templates (compatible with Google Docs and Word Online) or see below for more examples. This is just a quick note to thank you for your extra effort in getting the Smith-Klein proposal out yesterday. While the proposal didn't have a solid deadline, you made our company look efficient, professional, and timely in our interaction with these prospective customers. Customers look at how they will be treated just as they look at our product pricing. They've already given me a heads up this morning that they are already reviewing our proposal. The other thing for which I'd like to thank you is that I know how difficult it can be to light a fire under the other departments that had to get data to you so that you could put together the proposal. It's always tough to compete with current projects. Obviously, whatever you did—worked. Congratulations on that. Maybe you're willing to share your tips for what you did with the rest of our department. I'd like to see all of us learn from your success. Thank you for your work with the key product development team. Before you joined the team and provided leadership, the team was hard-pressed to meet any of the deadlines they had set. This was making our product releases untimely in the marketplace. Untimely releases meant unhappy customers who were anxiously waiting for an upgrade. It also affected your company’s sales and profits, so your work to disrupt this late pattern is truly appreciated by the whole senior leadership team. Every one of them has remarked on the difference and I have credited your leadership of the team with the change. They are appreciative as well since with your help, they will meet their goals this quarter. Keep up the good work for the future. It will be sincerely remembered as salary negotiations begin this year. The employee recognition letter can stand on its own as a powerful way to thank an employee for an effective contribution. It can do so much more if you follow the advice shared in these tips and evident in this sample letter. Rewards to accompany the recognition note are also viewed positively, but they are not the essential component in employee recognition. The heartfelt gratitude is. Don't ever underestimate the joy that an employee experiences when he or she receives an employee recognition letter from someone who is important to them at work.